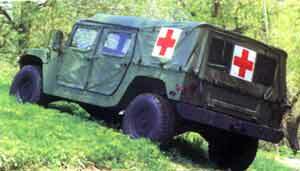 The M996, M996A1, M997, M997A1, M1035 and M1035A1 HMMWVs are the Ambulance configuration of the HMMWV family. The vehicles are equipped with basic armor and used to transport casualties from the battlefield to the medical aid stations. The M1035, M1035A1, and M1035A2 ambulances are 2-litter soft tops which have no armor protection for crew and patients. Fully-loaded M1035,'M1035A1, and M1035A2 ambulances will climb road grades as steep as 60% (31°) and traverse a side slope of up to 40% (22°). The vehicles ford hard bottom water crossings up to 30 inches (76 centimeters) without a deep water fording kit and 60 inches (152 centimeters) with the kit. The M1035A1 models have the latest modifications applied to the vehicles. The difference between the M1035, M1035A1, and M1035A2 2-litter soft top ambulances is that the M1035A2 is longer, due to new bumpers, and can be equipped with an optional 9,000 lb winch.